With a nod to the med and fragrant tastes of North Africa IMA delight customers with a tight menu of vegetarian plates. Bowls of sumptuous salads served with fresh pittas and dips keep the canal crowd satisfied at lunch, many returning later in the day for the very good coffee and dessert treats. Bear this bright, friendly cafe in mind for breakfast and brunch stops too where you can enjoy virtuous granolas and eggs or the rather more indulgent pancakes before heading out for neighbourhood activities. Alternatively you can order to go and perch waterside savouring mouthfuls of goodness and flavour under the sun. Well located with a corner site on a charming street this beautifully decorated hotel suits guests who like distinguished pared back style. Hints of subtle retro inspired details and delicately toned pattern, textures and wallpaper hinting at the Art Deco era give the rooms personality which go down well with those looking for a bit more than elegant but bland minimalism. 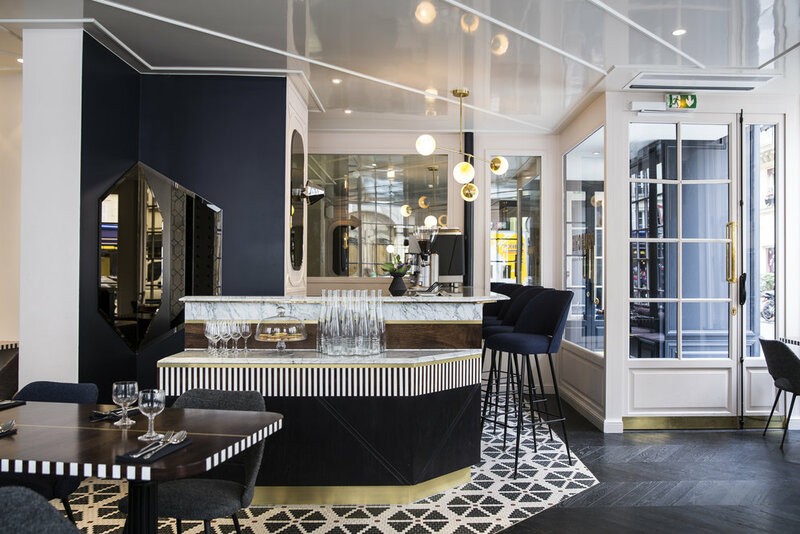 The public areas and restaurant are similarly classy sticking to a muted colour palette accented with beautiful tiles and finishings. Ditto the rooms which are not only beautifully designed but spacious too. The hotel is very welcoming to families with thoughtful touches such as teepees brought to family rooms, a cute activity Gazette and a secret room for kids to hunt out and discover. There is also a library with Paris themed books to browse. 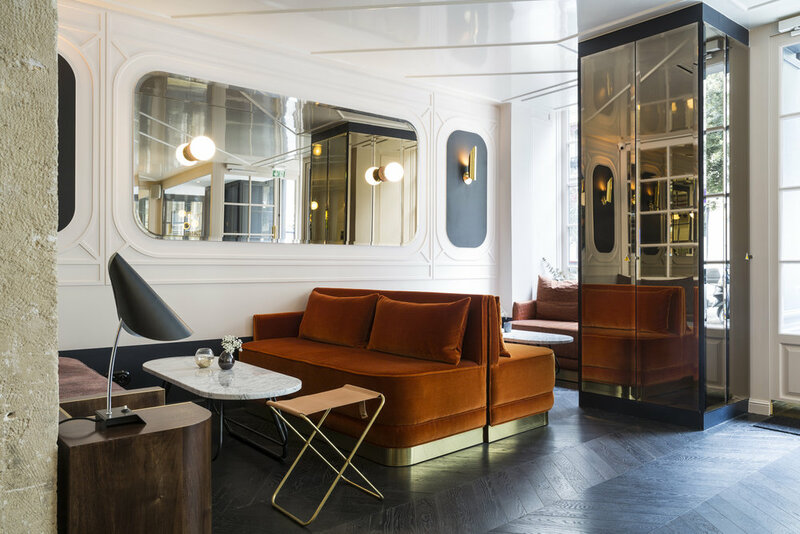 The public areas are gorgeous, welcoming and chic with a lovely lounge to relax over aperitifs. Triple rooms and family rooms will suit those with kiddies along down to the ground. 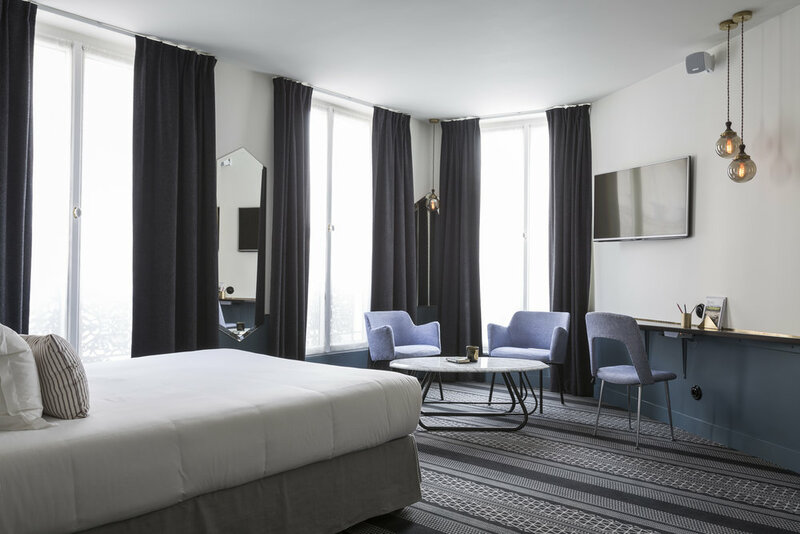 A super location in the centre of Paris' hotspots and key landmarks is an added, and welcome, bonus. 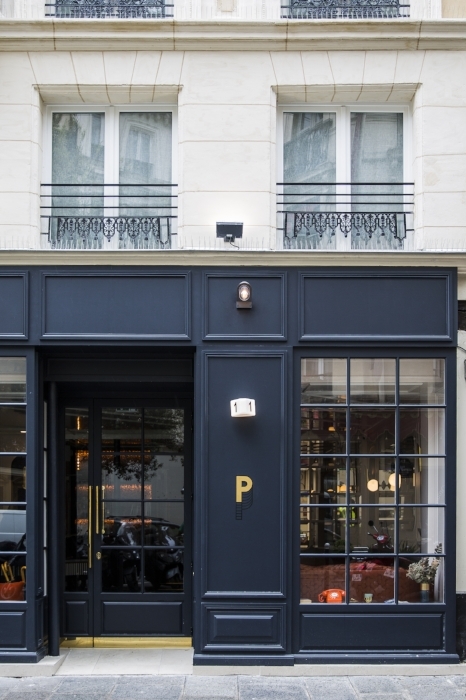 If exploring the Marais district when hunger hits, you could do worse than popping into scandi chic cafe Paperboy. Whilst the decor is pared back and the menu small it delivers full on gutsy American sandwiches, bagels and salads for lunch and cakes, cookies and brownies for snack. The substantial weekend brunch draws crowds and subsequent queues, so be prompt in order to be seated to indulge in the various menus - including a kiddie one. The cafe provides a great pitstop for a simple yet decent lunch but consider it too for times when a coffee break is on the cards and only a true US style brownie will do. Despite being in the heart of Paris, Parc Rives de Seine is easily missed by visitors hunting out the well known landmarks of the Right Bank, however a detour riverside leads to the capital’s new outdoor hotspot. Following the success of the Left Bank’s riverside revival in 2013 - running between Pont D’Alma and Pont Royal - this new section connects to the Left Bank section via bridges across the Seine, creating a vast riverside playground for those looking to escape the city buzz. Opened in April, this new dedicated stretch of Seine side riverbank between Pont Neuf and Pont de Sully has been reinvented as a 10-hectare nature-focused eco zone. Roads have been replaced with parks for fun and repose, fair trade snack outlets and green space for perfect picnicking. Paris has plenty charming squares and parks but locals are revelling in this newly created pedestrianised zone dedicated to relaxation, play and social interaction. Benches, deckchairs, and the odd hammock, provide ample seating to enjoy the scenery and partake in some people watching. It is a wholly multi functional and multi generational space hosting more mature residents gathering to soak up some sun and chat, families snacking and playing and young hip locals socialising over beer and a game of Pétanque. Energetic residents love this free outdoor gym, working out freestyle on the grass verges or pedal pushing on the exercise bikes stationed along the river. Runners jog, children scoot, skateboard and cycle amusing themselves with various activities including wooden play apparatus, climbing walls, balance games, swings, mini football pitch and grassy areas for free play. Nice touches include the decorative piano enticing the musically inclined to sit and play a tune or two, the 3D telescopes offering users a Parisian history lesson and the cute store selling quality Paris themed novelties. Sunny days can be spent lounging admiring the views, with picnics or bites from cafés and food stalls and containers dotted along the Quai. Evenings encourage dusk time aperitifs, sociable drinks and romantic strolls. The next time the heaving crowds at Notre Dame or the Louvre become overwhelming you know what to do. Access and activities are free making for a worthwhile, and economical, spend of a Parisian afternoon.